CBSE has announced Class 12 Economics re-examination on 25th April, 2018 and Class 10 Mathematics re-examination date is going to be announced shortly. Owing to the paper leaks, CBSE had decided to re-conduct Class 12 Economics exam and Class 10 Mathematics exam. Today, Central Board of Secondary Education in its press release officially announced the schedule for CBSE re-examination. CBSE has also made clear whether the exam is going to be conducted again for Delhi Region only or all around India. The mathematics Class 10th re-exam date would be listed here as soon as we are updated by CBSE. The Class 10th re-exam of Economics will be conducted for all over India while the CBSE Class 10th re-exam will be conducted only for Delhi and Haryana region. This decision was taken on the basis of various reports received by CBSE of leaked papers. This news has relieved the Class 10 students of re-examination. 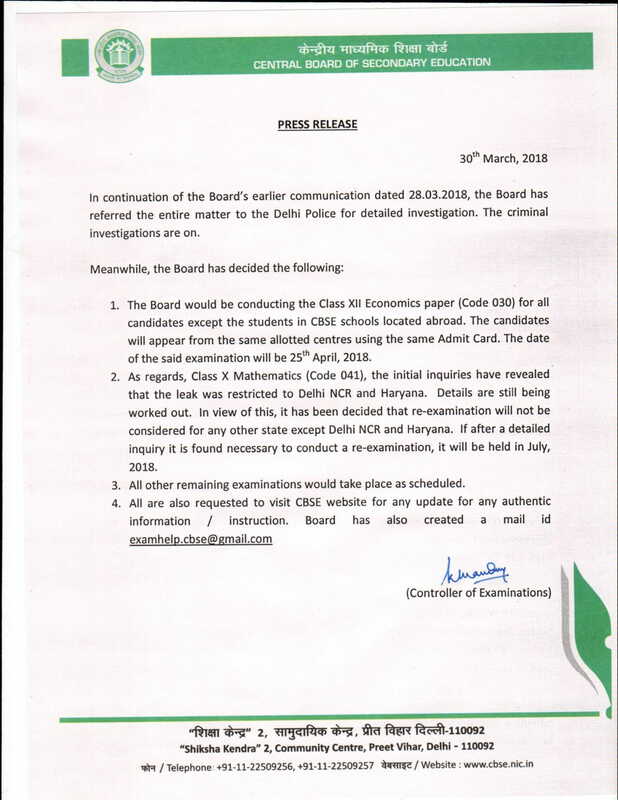 CBSE has forwarded the entire matter of leaked papers to Delhi Police for detailed investigation. We could just hope that these criminals who leaked papers are caught as soon as possible. All the CBSE students outside India are relieved from the re-examination as there are no reports of leaked question papers from abroad. Students affected by question papers leaks protested around the country to show their agitation. As of the current investigation, no person has been arrested over the paper leak.